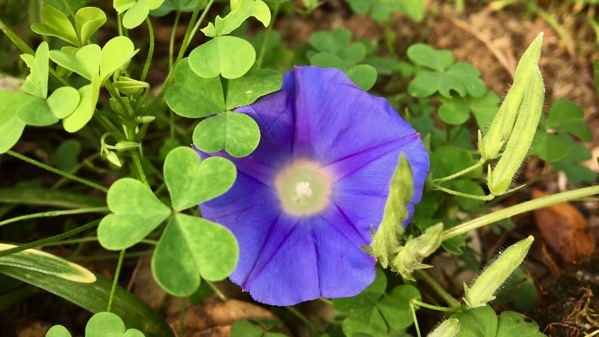 Native peoples of the lowlands of Mesoamerica used a cousin of this garden morning glory in converting rubber-tree sap into a version of what we’d recognize as rubber. Plant magic. The little upright pods…I don’t know their name, or what we called them when I was a kid and we’d harvest and eat them…a citrus-like bit that I enjoyed. Not much substance, however. This entry was posted on Wednesday, 15 August 2018 at 8:51 pm. We are home from August trip to UP. I used to collect are chew those little pods (clover looking) when I was a kid!